Abexo Free Registry Cleaner is the freeware edition of Abexo Registry Cleaner. 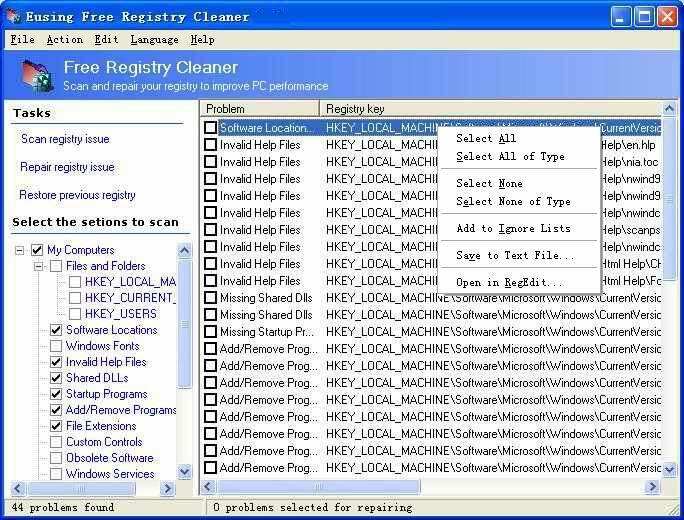 This software aims at making your computer run faster by cleaning Windows system registry. One-click registry backup, cleanup and defrag (shareware version only). Version 1.1 includes bug fixes and improvements. CleanMyPC Registry Cleaner scans the Windows registry and finds incorrect or obsolete information in the registry. By fixing these obsolete information in Windows registry, your system will run faster and error free. The backup/restore function of the tool lets you backup your whole Windows Registry so you can use it to restore the registry to the current status in case you encounter some system failure. Also features Startup and BHO organizer.